Part 5 in our series on the “Hail Mary”. This week’s meditation on the Hail Mary is about vocation. Mary is not generically blessed: she is blessed among women. St. Elizabeth’s words pair this statement with a description of Jesus as “the fruit of your womb.” In English (though not Greek or Latin) you could think of the word woman as coming from “womb” (like a man, but with a womb! ), and the womb is the most womanly part of woman. In fact, this pair spells out what we saw in the first pair. Mary is full of grace because the Lord is with her – but the Lord is with her as fruit of her womb, and she is with him, and full of grace, precisely as woman. Mary makes it so concrete: she lives in union with Jesus not through abstraction, but through her vocation as his mother. She carries him, births him, nurses him, cooks and cleans and mothers for him, bosses him around at Cana, and experiences his ministry, his cross, his resurrection, and his ascension – and even Pentecost, and her own arrival in heaven – precisely as his mother. Her vocation colors everything about her relation to him. It colors, too, her relation with her neighbor. Beautiful that the one who calls her “blessed among women” is her woman friend – and, indeed, her relative, descended from a common womb – Elizabeth. Together they are doing women’s work, preparing for their babies. She relates to Elizabeth not as an abstract individual, but as a woman – and, in addition to her gender, also in a family, in a place, in a historical period, in a language, etc. They are not abstractions, they are people, and it is there, in their human particularity, that God’s grace comes to meet them. Nor does Mary’s femininity shut her off, as if “among women” means that she doesn’t get to be around men. Luke adds the nice little detail that she “entered Zechariah’s house, and greeted Elizabeth” (Luke 1:40): Zechariah is around too! More importantly, Mary has Joseph. There are various things to love about St. Joseph, but one of the finest – Marie-Dominique Philippe’s The Mystery of Joseph explores this in all its Scriptural richness, but it also plays a prominent role, for example, in Leo XIII’s encyclical on St. Joseph Quamquam pluries – is that Joseph is Mary’s husband. Mary and Joseph are not abstractions, they are a man and a woman, making a home together. 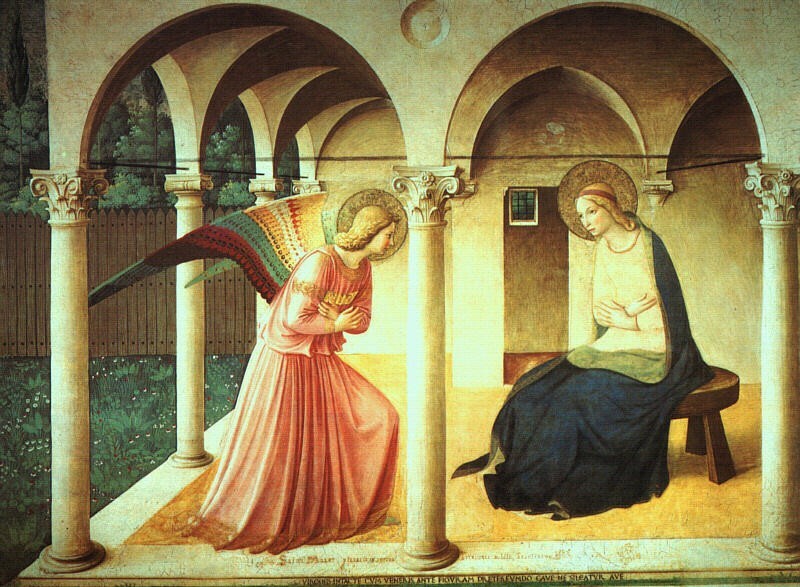 Together they marvel at the things that are said of Jesus (Luke 2:33), together they seek for him (2:44-46), Mary speaks for his feelings, “your father and I have sought you sorrowing” (2:48). They were engaged to be married, and Joseph trembled to take her to himself, and trembled to lose her. They built a home together, eating dinner, knowing their neighbors, and establishing customs: “his parents went to Jerusalem every year for the passover” (Luke 2:41). And later Jesus will give Mary to John to be his mother (John 19:26-27), and she will gather with the apostles as “mother of Jesus” (Acts 1:14). In all of these things Mary is profoundly woman, profoundly in relationship, profoundly personal. There is no abstraction in the life of grace. Grace graces our life, in all its particularity. Is this limiting? Well, yes and no. To speak of Mary in terms of her womb is to reduce her to biology. And, indeed, Jesus is careful to say there is more to us than just our biological acts: “rather, blessed are they that hear the word of God and keep it!” (Luke 11:28) But Mary keeps the word of God in her vocation. Her biology – “the womb that bore him, the breasts he sucked” (Luke 11:27) – becomes the place of her encounter with Jesus. We are limited by our vocations. We cannot meet Jesus anywhere else than where we are. Those limitations are very real: so many things I can’t do – and so many things I must do! But the wonder of the Incarnation is that God, who created this particularity in the first place, then took it on himself when he walked in a particular body in a particular time and place, comes to meet us right where we are. Sometimes that seems unimportant: Mary is “just” a woman, not a priest like Zechariah. But it is God who makes the little things matter. By the way: did it ever occur to you that Mary had a funny accent? “They that stood by said again to Peter, Surely you are one of them: for you are a Galilean, your way of speaking gives you away!” (Mark 14:70; cf. Luke 22:59 and Acts 2:7) They will know that we are Christians by our funny accents. Click here for the rest of the “Hail Mary” series.